"The Desert and the Sea" is a 3D exploration and adventure game set across two parallel worlds. As a cast away on a small tropical island, you encounter mysterious artefacts that provide links to a parallel world: to get back home you need to venture across time and space. I still haven't been able to get a standalone osx app working with pygame/pyopengl, but will keep trying. Finally got the game all finished and wrapped up at about 6:45am after a marathon night pretty much non-stop from about 8pm. I'm pretty happy with the final result: there are one or two niggly graphical bugs I couldn't rectify before release, but nothing major. Spent most of Day 7 implementing about 60% of the game levels and puzzles: the results are OK, but I was hoping to implement a bit more variety, but just did have enough time. I'm happy with the overall feel of the game. Don't have access to a windows machine at this moment, so hoping to build an exe release tomorrow, but probably won't get it done until after the deadline. I've been running at a pretty hectic pace, so haven't had much time to write anything. I'm working on a 3D first-person exploration/adventure game set within two worlds connected via portals that transport you between simultaneous positions in space but in different worlds. This years theme was my top pick, so I was pretty happy; had a basic idea of what I would do with this theme straight up at the start. 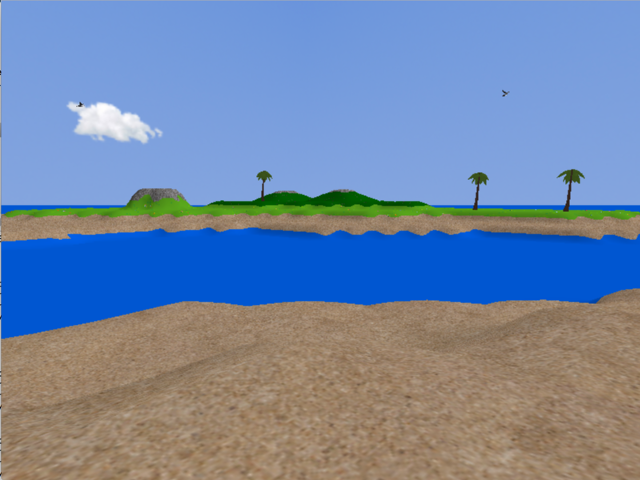 Day 1-3: pretty much spent all of this time world building: created a little beach with a bit of audio atmosphere and critters. I spent most of day 3 figuring out how to get pyopengl to load large obj files quickly (well quicker than the default implementation I started with). Day 4: started implementing teleportation mechanics, interaction with world objects and control panels etc. Day 5: fine-tuned the audio and composed some background music, implemented nuisance stuff like title screens, pause screens etc. I think I'm pretty much on track for finishing on time, but as usual, it will be a marathon stretch to the finish :). This theme is about worlds, so I've pretty much spent the whole first three days doing some world building. Still putting my thoughts together, but aiming towards an idea based on a sort of 5D space Myst-like exploration game between two worlds that occupy the same space, but in alternate realities.